Ironically, the day we shot this outfit, it was unseasonably warm in the Bay Area—I was at an outdoor party earlier in the day and had to strip down to my T-shirt because it was so hot in the sun. Of course, by the time I got home, it was getting foggy and windy, and such is life in Northern California. 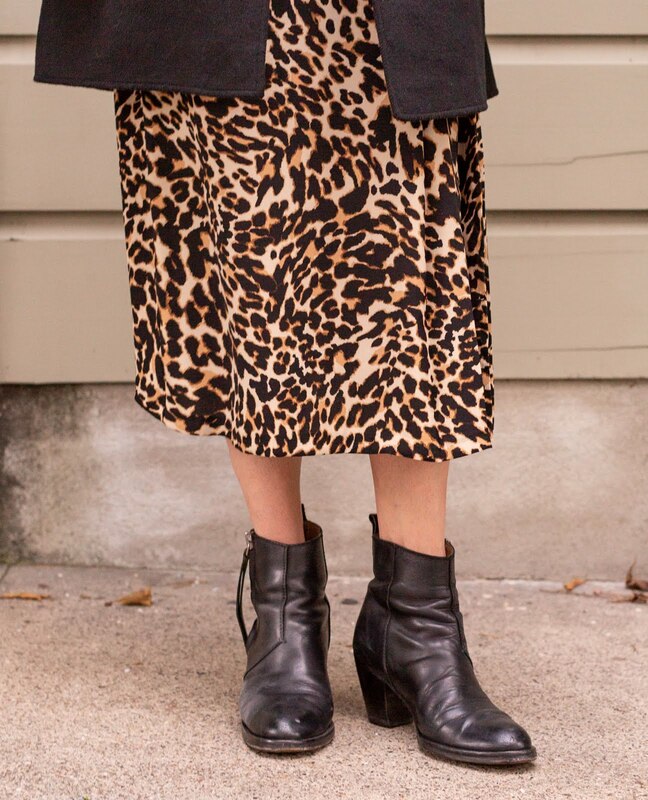 Anyway, if you watch my Instagram stories, you know that I wear this leopard-print midi skirt all the time in real life, so in spite of the fact that I shared it just a few months ago, I wanted to feature it again, this time with a more winter-friendly spin. I have come to a conclusion, and that is that midi skirts are generally more flattering on most people than maxi skirts. This is because with a midi, you get to show the most shapely part of the leg—the calf and ankle—and with a maxi, you appear footless. Not to mention the fact that most of my maxi dresses have been destroyed at the hem by various shoe buckles and heels. Midi skirts elongate your lower half just enough, and you can wear virtually any shoes with them—there's kind of no right or wrong way to do it. 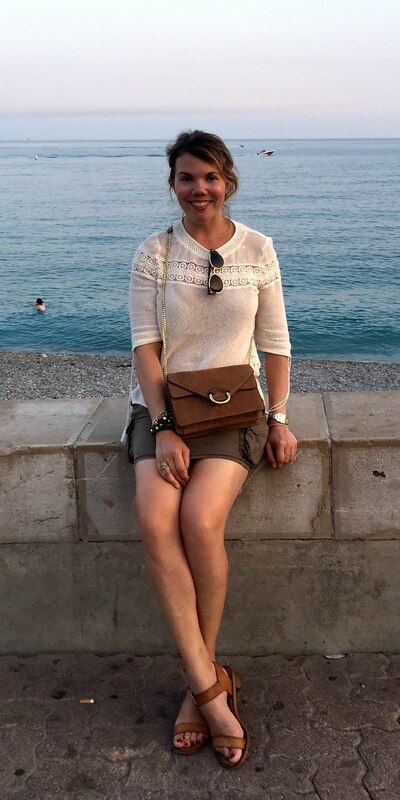 I am a fan, especially as my thighs aren't as firm as they once were, making midi skirts the all-around winner for women over 40. This one in particular is from Zara and long sold out, but I've linked several similar styles below. The last time I wore this skirt, I paired it with light neutrals. This time, I went super bold with a red sweater. 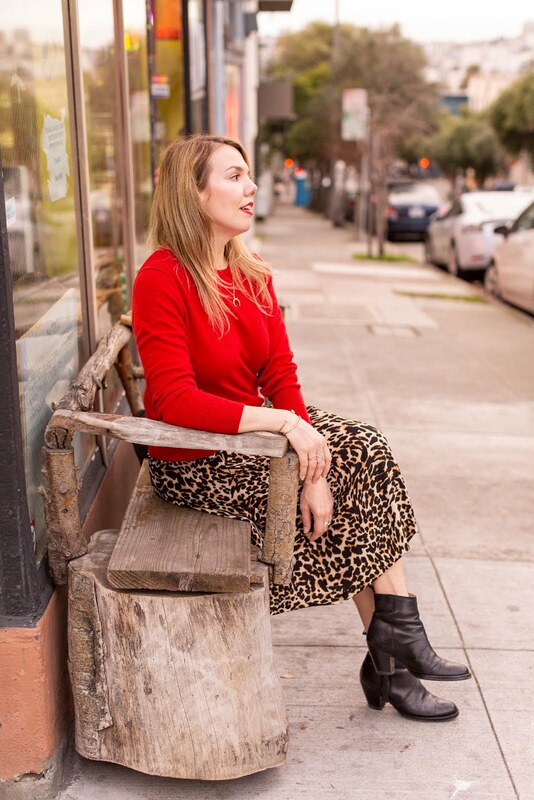 There is probably some rule out there about not wearing red with leopard, but rules were meant to be broken, and as my friend Catherine from Not Dressed as Lamb says, I will wear what I like. This sweater in particular is Everlane's famous $100 cashmere crew, and as you know, I love me some Everlane. I bought a couple of their cashmere sweaters a few years ago, and I can report that this one is not nearly as soft or as thick as those. Still, $100 for a cashmere sweater is not bad, and I'm hoping this one mellows out a bit with age. I sized up to a medium because I wanted a little more slouch. I am kind of obsessed with this coat, which I last wore in my New Year's Eve post. Here, you can get a better idea of what it really looks like—the body is woven and the sleeves are a ribbed knit, like a sweater. 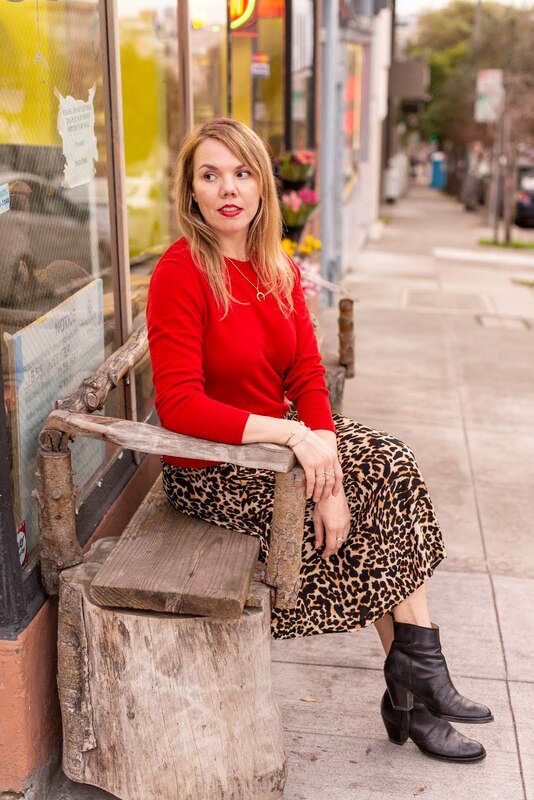 It's half sweater, half coat, and totally perfect for San Francisco weather (well, except on the day we shot this, as I mentioned before). It's unlined and thus probably not quite warm enough for most of the country right now, but if you live in a more mild climate as I do, it's a worthy investment. I'm in a small—it runs a little big. 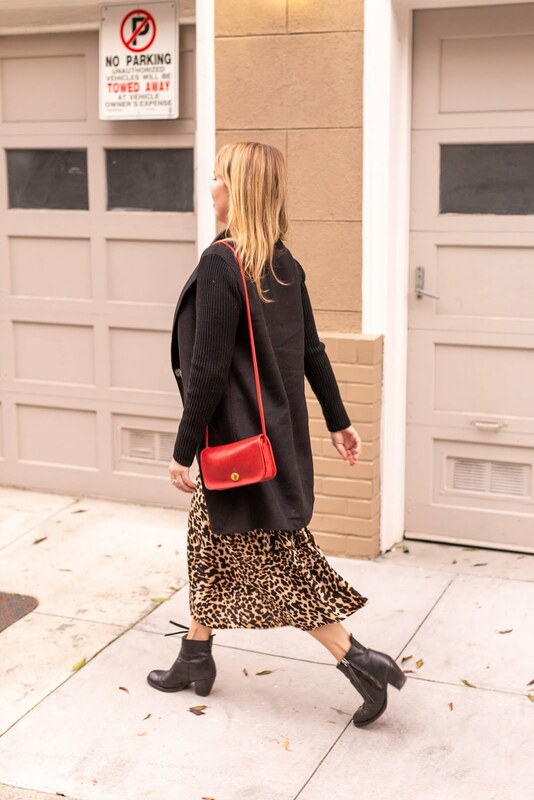 As I mentioned before, I think you can wear pretty much any kind of shoes with a midi skirt, but my feet get cold in the winter, so I went with my trusty Acne Pistol boots (last seen with sweatpants—they truly go with everything). If it were a really cold day, I would have worn tights too, but I like how my bare leg provides a little bit of contrast. As for the bag, I kid you not, I bought this Coach purse with my babysitting money when I was 13. It was my designer bag gateway drug and, yes, I still carry it! I'm slowly learning that the more neutral the backdrop, the better for these posts, but with so many Victorian houses in San Francisco, sometimes that's easier said than done. And also, sometimes you just see a good bench in front of a bodega, and you shoot there too because the lighting is amazing. And you pretend not to get embarrassed when people keep walking out with beer or chips or milk or whatever. Such is the life of a blogger! That skirt is so cute on you! I love how you paired it with red! Fabulous skirt! It looks great with the ankle boots and red sweater. I'm a big fan or leopard print and red together. Thanks for linking up! 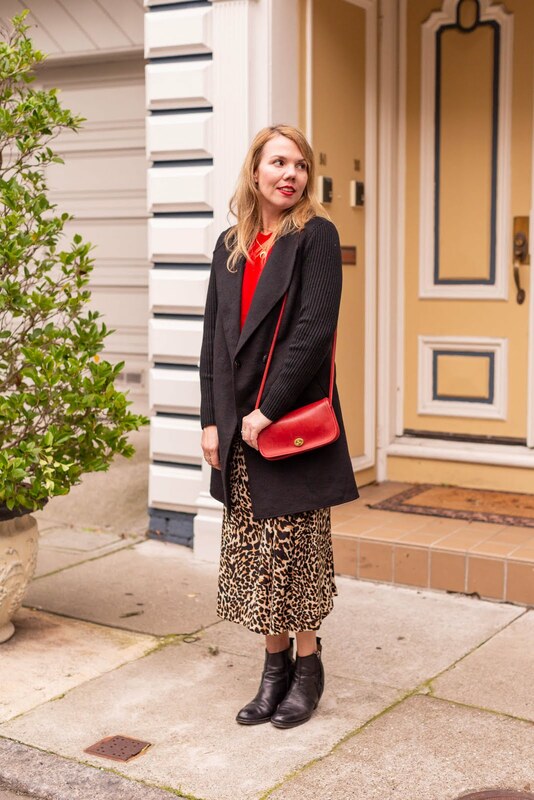 This leopard skirt is so pretty and I love how you styled it with red! Those boots really pair well with the entire outfit and I love these photos of you!